Giddy up for the Mustang Roundup coming up on Friday, Sept 21 @ 5:30pm! 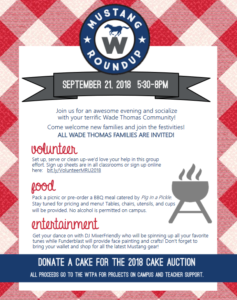 Calling all families for a back to school evening picnic filled with face painting, crafts, dancing, and of course the traditional cake auction! If you don’t feel like packing a picnic, you can preorder a bbq meal from Pig and the Pickle (link coming soon)! We also need volunteers, click here if you’d like to help out! ← Student Council Elections are on September 26th!